DJ Scene just posted a bulletin online of a new night that goes down on Sundays. Along with DJ DV One, they'll be servin up some "90's served fresh." 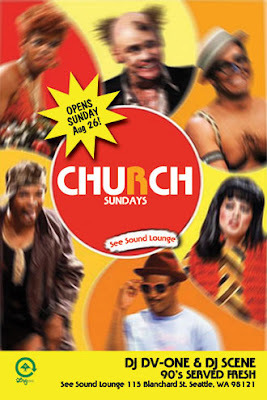 It starts this weekend and coincidentally God (fill in the blank of your choice) goes to Church at the Seasound Lounge in Belltown. Holy Jesus, praise the beats! Be sure to tithe, the bartenders appreciate it.